QUESTION: Is it safe to feed my fish right now? Fish are cold-blooded animals. They do not generate their own body heat. Their body temperature is reliant on their environment and the water temperature of your pond. Fish conserve energy by remaining closer to the bottom of the pond when the water temperature is below the mid 50°F’s. This is their way of hibernation. Fish cannot generate the enzymes necessary to digest food at these lower temperatures. Your fish will live off of the stored body fat from the warm summer months they were busy preparing for their hibernation. Once the temperature of your pond water is consistently above 50°F, it is safe to feed your fish all-season fish food again. There is less protein in the all-season food, making it easier for the fish to digest in cool temperatures. 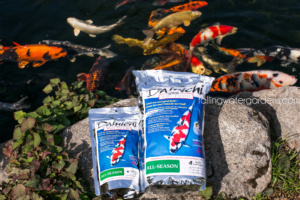 Dainichi is our personal favorite and go-to fish food brand. Dainichi’s ALL-SEASON is an excellent year-round source of easily assimilated marine and vegetable proteins. The generous portion of marine proteins promotes rapid growth, while the high vegetable content ensures quick and easy digestion in all temperatures. In addition, the shrimp and spirulina enable ALL-SEASON to perform very well in maintaining vibrant colors of all koi varieties. This formula can be used in conjunction with all other Dainichi Koi Foods, however, it is especially beneficial during cooler weather when the koi’s metabolism is slower. When the water temperature is consistently above 60°F, the fish become much more active. This is when you should start feeding the fish a higher protein fish food. GROWTH PLUS is Dainichi’s specialty growth formula. Formulated with unprecedented amounts of Antarctic krill, shrimp and white fish meal, this formula’s main objective is to produce a maximum growth and superior body conformation. With the exception of the readily convert-able carotenoids from the krill and shrimp, there are no other color enhancers added to impair the unmatched growth performance. As in all other Dainichi koi foods, GROWTH PLUS contains calcium montmorillonite clay to simulate the natural ingestion of mineral particles and to bind and neutralize metabolic toxins. Raw, fully potent vitamins, digestive enzymes and garlic ensure that the fish are healthy and free of internal parasites. Furthermore, the scouring action of the clay enhances a continued rejuvenation of the digestive tract, which in turn ensures a maximum rate of digestion and assimilation of nutrients. 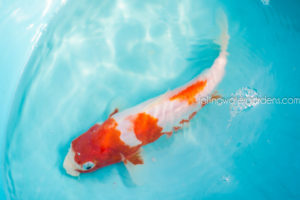 With only two sources of starch (flour as binder and wheat germ as a source of vitamins E and B), GROWTH PLUS keeps the body conformation of all koi in a constant show-ready condition. As an additional benefit, the low waste production by koi helps keeps the dissolved organics levels low in your pond, making it an invaluable aid in eliminating algal blooms. Warm Winters – Is it safe to feed my fish?! During a warm winter where the water hovers between 50°F-55°F and the fish seem to be swimming more toward the surface, fish owners often think the fish are asking for food and they are tempted to feed the fish. There are two potential problems with feeding your fish at this temperature. #1.) If the temperature drops below the 50°F-55°F, the fish cannot create the enzymes necessary to digest the food. The food can putrefy in the intestinal track, creating bacteria that can get in the blood stream and kill the fish. #2.) Your biological filter will not be active at these low temperatures and will not be able to cope with increased ammonia levels caused by feeding the fish. You could kill your fish if the ammonia levels rise too high. Koi and goldfish are omnivores and can usually find enough to eat at the beginning of the season. If they are hungry, then they will instinctively eat the algae growing in the pond and that is much easier for them to digest than fish food. Our suggestion to fish owners is always the same; when the water temperature is hovering in the low to mid 50′s and there is still a chance that we can get freezing weather that can drop the water temperature below the mid 50′s, then it is better to err on the side of caution and resist the temptation to feed your fish. Still have questions or have another question to ask? Fill out our contact form or send us an email here. Visit Falling Water Gardens if you need to stock up on fish or fish food!